You will need: A match, thumbtack. SCIENCE EXPERIMENTS & AMUSEMENTS FOR CHILDREN BY CHARLES VIVIAN. Simple Technical Steped Practical Projects for school and college students. You will need: A match, thumbtack. There are several points on your body where the blood pulsing through your arteries can be felt just under the skin. Your blood is pumped on its surprisingly long journey (your blood vessels have a combined length of many thousands of miles) by the beating of your heart. Certain illnesses can alter the normal rhythm of this beating, which is why a doctor often feels the pulse at your wrist to see if it is regular and at a normal rate. If you place a finger across your wrist you should have no difficulty in finding your own pulse. Now take a thumbtack and stick the end of a wooden matchstick on the point of the pin. 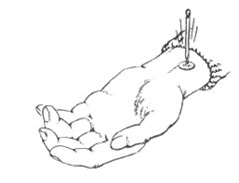 Position the head of the thumbtack above the place where you felt the pulse beat at your wrist. Now hold your hand and arm perfectly still and you will see a slight but regular movement of the match as it moves to the pulsing of your blood beneath the head of the thumbtack. Children are clever. They learn a lot, without being taught. The greatest skill to be able to talk, to communicate is learnt outside school. In the classroom it's the children who need to talk the most. Unfortunately it is the teacher who does most of the talking!